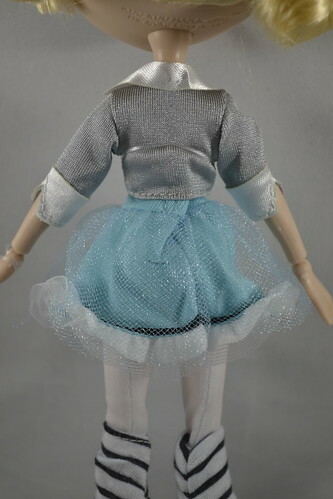 First up is the G doll. These dolls are somehow related to Gwen Stefani, and I imagine that’s what the G is for. 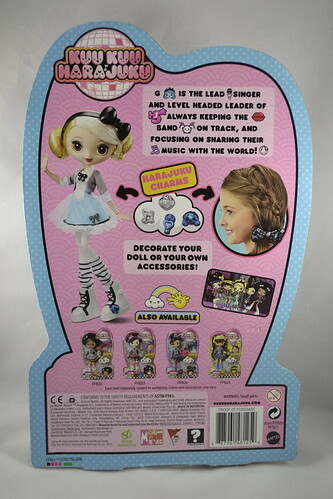 The other dolls have names like Baby, Love, Music, and Angel. G definitely stands out as the odd name in that group. 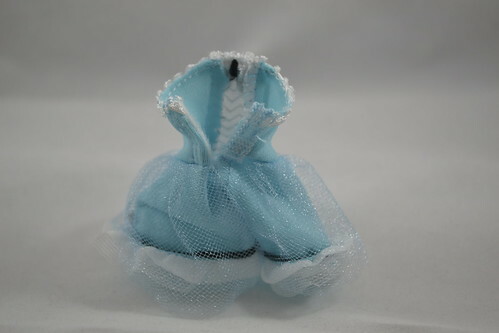 Each doll comes with an accessory for the doll owner and four little charms. 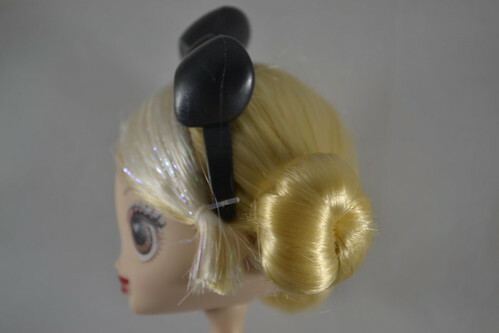 These charms fit in little holes on that accessory, in the doll’s shoes, and on their headbands. G wears her hair in two buns (a-la-Princess Leia). These dolls are packaged with their heads attached to the cardboard. Blah! 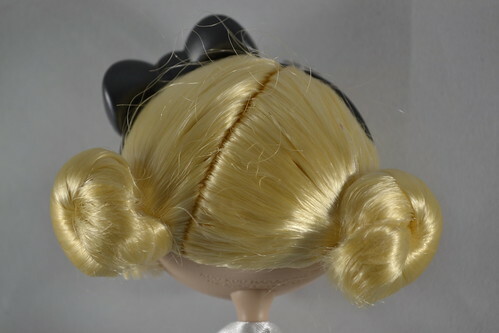 These dolls have an interesting profile with a cute tiny nose. You can’t really see her ears here, but they are cute and tiny as well. They are not pierced. G wears a blue dress with a grey jacket/blazer. The two are separate pieces. The jacket is cute enough. It doesn’t close in any way. Although I wasn’t a huge fan of the jacket alone, her outfit does need that additional piece to feel complete. Her stockings/leggings and leg warmers are two separate pieces. The dress is all one piece that velcros in the back. 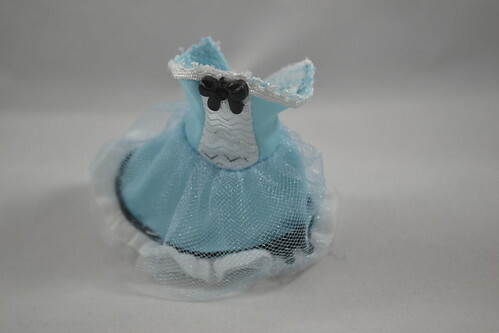 I was a little too rough with mine and that bottom piece of tulle that was sewn to the bottom of the skirt separated itself. Whoops! Okay, these shoes are the weirdest. Her tiny little feet are pointed in a similar fashion to EAH or MH. 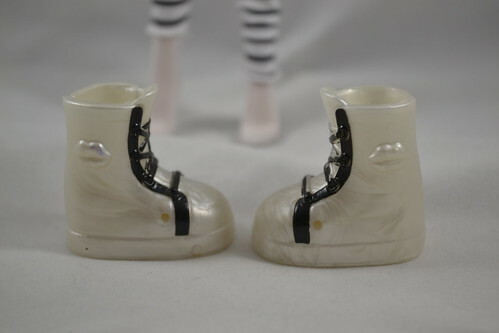 But these boots almost remind you of Bratz boots. They kinda click into place when you put them on, too. Okay, so now that you’ve seen all of her clothes…. what about the doll herself? 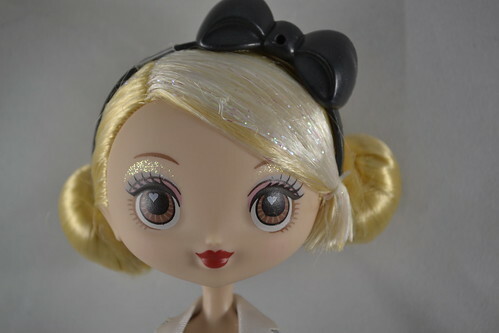 How does she compare to say… an Ever After High doll? I should have taken measurements on the doll herself. Here she stands in all of her glory! 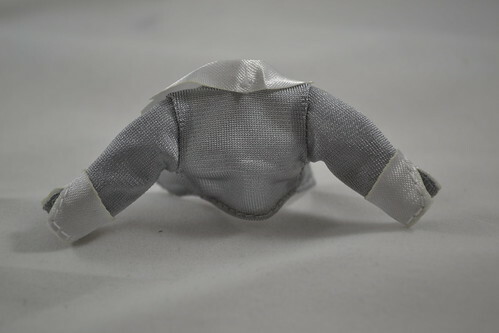 She has the standard 11 points of articulation – neck, shoulders, elbows, wrists, hips, and knees. I’m honestly loving her little body and huge head. 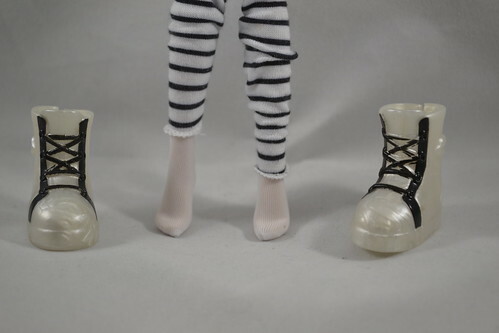 But then, I collect Pullips, so this proportion system isn’t new to me..
G can sit with her legs and knees both at right angles. She would do well in a chair, but I didn’t have one handy. But not side splits. That’s okay… who needs to go that way anyways? G stands just a little shorter than an EAH doll. Her hips appear smaller and her hands are in a different position. Her feet are totally different. Her legs are shorter…. but wait. 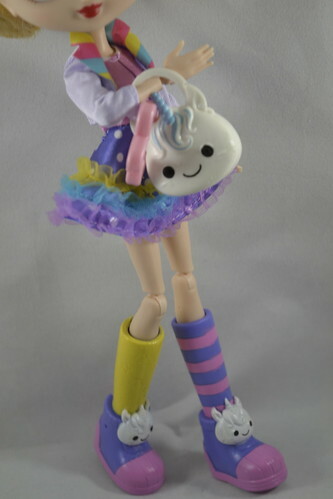 Isn’t that how EAH dolls get their varied heights? So Lizzie refused to strip down for us, but you can see that G stands almost shoulder-to-shoulder with the shorter EAH dolls. Her torso is still very different, as are her calves and feet, but you can see that height-wise she is right there. This also lets you see just how huge her head is. Some people thought EAH had big heads? Ha! What weird toes you have…. 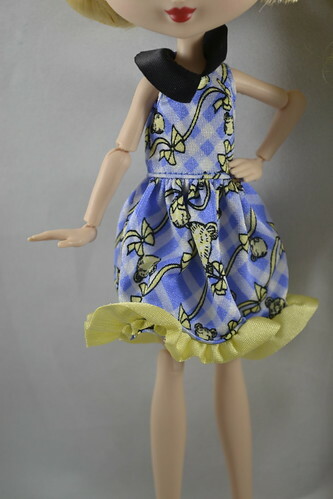 G can technically wear Blondie’s dress, although she looks like she is stealing her older sister’s clothes. Blondie can totally NOT get away with wearing G’s dress. I also bought two fashion packs. I think I’ll add their review here and then cut this off so that it isn’t too picture intensive. I fell in love with the sushi themed pack. 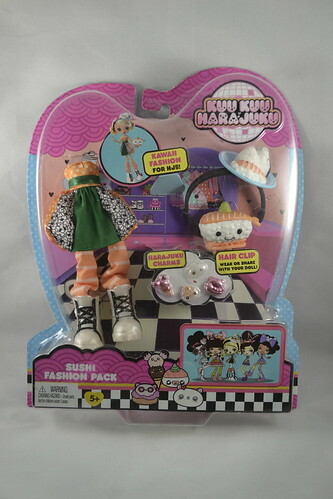 The fashion packs include an outfit, a headband, shoes, an accessory for the doll owner, and four more charms. Can you see the thing that made me mad about this pack in particular? What the heck! I already have those shoes! I’ve only unboxed two things and already have repeats?! What the heck! That’s not cool Mattel! 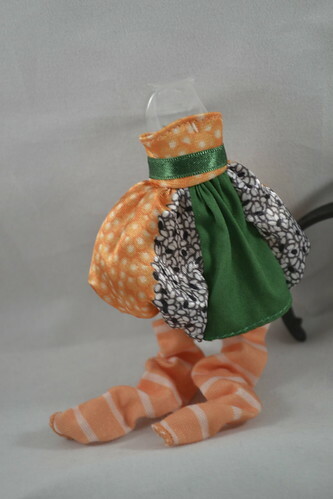 Anyways… the dress is cute… and so are the leg warmers… now if only we got some cute orange boots… They didn’t even change the color! You could have done the same boots but in orange and I wouldn’t have felt ripped off as much!! 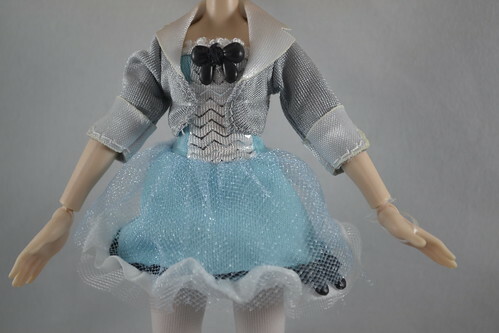 G looks super cute in the outfit…. so I’ll stop complaining for now. The other fashion pack I bought was the Rainbow Unicorn pack. While intended for Baby, I put it on G because once you’ve gotten a doll naked… well… you might as well take advantage of that. 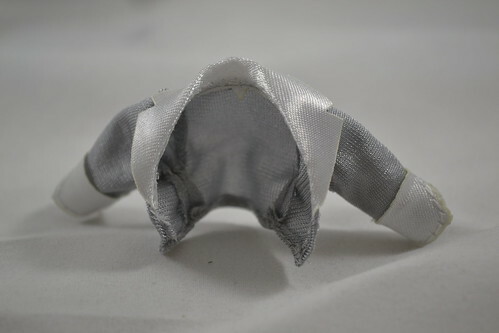 This pack came with a bow headband (any guesses as to why I picked this pack?) that has a unicorn on it, a dress with jacket, unicorns boots with plastic attached socks, bracelets, a unicorn purse/keychain, and four more charms. I honestly didn’t expect G to rock this outfit like she did. You go girl! 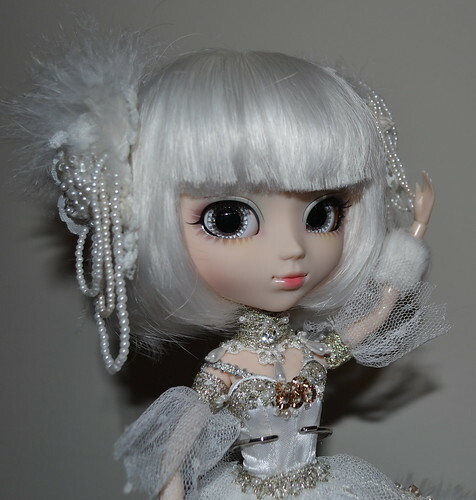 I’ll end this review here and post the other two dolls on their own page. 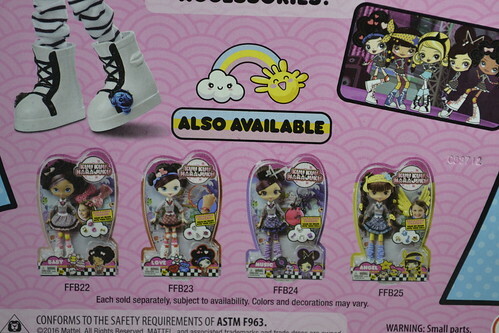 What do you think of G and the Kuu Kuu Harajuku dolls so far? Is this a line you think you’ll get into? Or will you be passing on Mattel’s latest attempt to get your money? 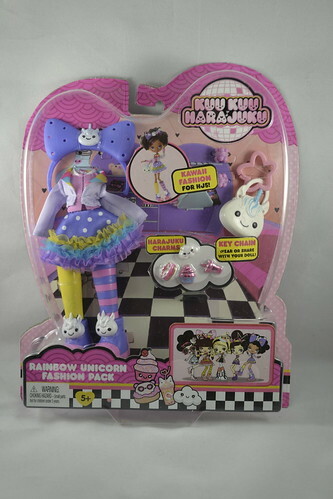 So Gwen Stefani has extended her Harajuku line into the toy category. I love the perfumes and these dolls look pretty cute. The only worry I have is that they’ll lose those separate pieces of clothing over time like what Mattel did to Ever After High. Awww! They’re all so adorable. I do want them all. I don’t know if I’ll actually go through with buying them, but I do want them. They are cute indeed, but I’m sick of big headed dolls and I’m not a fan of Mattel quailty, lately. Maybe if they come up with better fashions that aren’s the same cheap short mini dress, then maybe I will give it a try.